Saving for retirement is a life-long activity. Saving as much as you can over time pays off because doing so lowers the amount of tax you pay each year and allows you to accumulate more assets for your future retirement. There are a variety of tax-sheltered plans that will accumulate retirement savings. Each plan has its own unique set of rules for determining what is considered taxable income in retirement. Here is a list of the basic retirement plans that every taxpayer should understand. Any taxpayer with earned income (from wages or self-employment) can fund an IRA (individual retirement account). Your IRA contributions may be tax-deductible. There are traditional (deductible) IRAs, Roth IRAs, and non-deductible IRAs. Which one is best for you depends on your income, whether you are covered by a group retirement plan at work, and whether you prefer a tax deduction now or tax-free income in retirement. In 2019, you can save up to $19,000 in your IRA, up from $18,500 in 2018. The limit for individual retirement accounts is $6,000—up from $5,500 in 2018. You can make regular contributions to a traditional IRA up to age 70 1/2, provided you have earned income. The contribution limits consist of a "base" contribution limit and a "catch-up" contribution limit. For example, in 2019, the base contribution limit is $6,000. For IRAs, you can put in an additional $1,000. Therefore, a person who is 52 years old, and otherwise qualified for a Traditional IRA, could contribute $7,000 to his or her account. Contributions to a traditional IRA are tax-deferred, meaning that you do not pay income tax until you withdraw the money. You can begin making withdrawals from your traditional IRA at the age of 59.5 years old without having to pay the early withdrawal penalty. You must begin taking withdrawals and paying tax on those withdrawals. All withdrawals are taxed, including past contributed principal, since it was tax-deductible at the time the contribution was made, by the age of 70.5 years old so you cannot accumulate too much money in the tax shelter. If your income exceeds specific levels, you may not be able to make tax-deductible contributions to your regular IRA, or the amount of your contribution may be limited due to certain restrictions. But you still can save for your retirement with a non-deductible IRA contribution. Although your non-deductible IRA contributions won't reduce your taxes in the year you make them; you can tax-defer the earnings on them. This is the key tax advantage of a regular IRA. Although you will not receive any immediate tax benefit from a non-deductible IRA contribution, the tax-deferred growth may ultimately make the contribution worthwhile, especially if you expect to have a lower tax rate after you retire than you do now. Contributions to a Roth IRA are made with after-tax dollars and are not tax deductible at the time they are made. However, unlike a traditional IRA and subject to certain minimal conditions, if you need to make a withdrawal of your past principal contributions, you can do so tax-free without an early withdrawal penalty, though you won't be able to replace the funds once they've left the account. 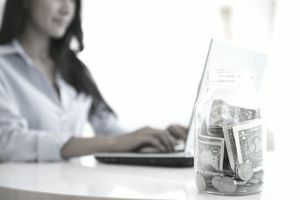 There are tax consequences for any investment gains or other funds in excess of the historical contributions into the Roth IRA if taken before the age of 59.5 years old. During the years the money is in the Roth IRA, any profits you generate will grow tax-free and there is no mandatory distribution age. Bankruptcy protections that cover the traditional IRA and Roth IRAs. If you have income exceeding the limits for a regular IRA deduction, a Roth IRA might be preferable to a non-deductible IRA. Although neither contribution is deductible, with a regular IRA, the contribution grows tax-deferred, but a Roth IRA contribution grows tax-free. A 401(k) plan is a workplace retirement account that's offered as an employee benefit. The account allows you to contribute a portion of your pre-tax paycheck to tax-deferred investments. Every dollar you contribute reduces your taxable wages, thereby lowering your taxes. (The limit is $19,000 per year if you are age 50 or older.) For example, you would be taxed on $70,000 if you earned $75,000 and contributed $5,000 to your 401(k). Investment gains grow tax-deferred until you withdraw the money in retirement. If you withdraw funds from the plan before age 59 1/2, however, you could pay a 10 percent penalty and the withdrawal would be subject to federal and state income taxes. Many employers match employee contributions to a 401(k), typically up to 6 percent, although it might "vest" its contributions over a period of years. This means you would not be able to take your employer's contributions with you if you leave the company before the prescribed period of time has elapsed. Your own contributions to the plan are always yours, however. An employer match is effectively free money. Employers who offer these plans are often willing to let you make contributions through automatic payroll deductions, making saving easier. Other types of 401(k) include the 403(b), a similar account offered to educators and nonprofit workers, and 457(b) plans, which are offered to government employees.